Based on Black Dog's best-selling book The Louvre: All the Paintings, this beautiful, informative card deck is the perfect way to experience the treasures of one of the most spectacular masterpiece collections in the world. The Louvre is the most visited museum in the world. The paintings of the Louvre constitute the richest and grandest collection of European art anywhere. Culled from Black Dog's best-selling book The Louvre: All the Paintings, The Louvre Art Deck distills into 100 6 3/8" x 6 3/8" cards the museum's most iconic and significant paintings. Also included are 10 other masterpieces like The Venus de Milo and I.M. Pei's Pyramid. On the front side of each card is a fullsize photograph of the painting, and on the back is text by art historian Anja Grebe on the key attributes of the work, what to look for when viewing the painting, the artist's inspirations and techniques, biographical information on the artist, and more. The cards are also fully annotated with the name of the painting and artist, the date of the work, the birth and death dates of the artist, the medium that was used, the size of the painting, the Louvre catalogue number, and the room in the Louvre in which the painting can be found. 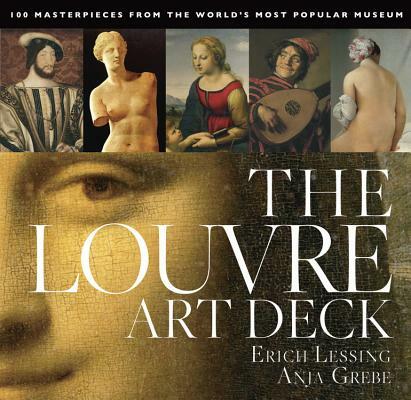 Perfect for students, art lovers, and armchair travelers alike, The Louvre Art Deck is a unique way to enjoy and learn about the greatest works of the great master artists.